Some notes and observations from the practice field as the Vols worked in Neyland Stadium on Saturday morning. “Competition Saturday”: Butch Jones labeled Saturday’s session “Competition Saturday” as the Vols moved practice to Neyland Stadium and had several scrimmage-like situations during their two-hour session. From the portions open to the media, it seems that the practice lived up to its label, with some good-natured trash-talking going on between the offense and the defense. Butch Jones was extremely active on the mic – challenging both sides of the ball on their effort and style of play. Field conditions: One positive note that Tennessee fans will be glad to hear is that the field condition was very impressive in Neyland on Saturday. That may not mean a lot in the spring, especially since the issues have cropped up later in the football season the past couple years, but it did look better than it has in the past in the spring and, maybe, just maybe, this will be a better year for the turf. Injury notes: Linebackers Elliott Berry and Colton Jumper continued to be in green, non-contact jerseys. When the Vols were in the scrimmage portion, Jones urged both sides to “thud” up and not take players to the ground as the Vols try to combat the injury bug. 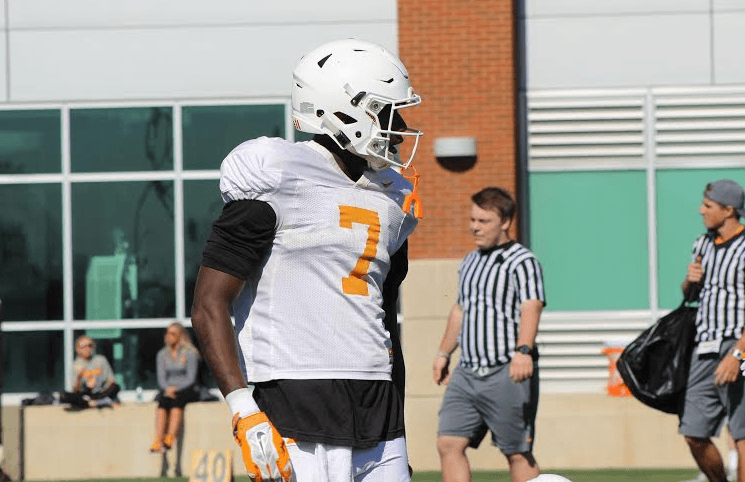 • WR Preston Williams: I’ve written about him multiple times this spring, but he continues to be a guy that stands out in almost every portion of practice. He has great body language, looks fresh and healthy and is making tough catches – looking more like the playmaker that fans were hoping to see more of last year. • WR Josh Smith: I thought he had a particularly good session on Saturday, making some tough catches. He’s be consistent all spring. I’ve seen very few balls intended for him hit the ground. • DE Austin Smith: Not sure if he’s figured it all out yet, but it seems like he finds a way into the backfield when he’s on the field. • RB John Kelly: He’s not Alvin Kamara or Jalen Hurd, but he is taking advantage of his opportunities to get a lot of reps this spring. I’ve been particularly impressed with his hands and his ability to run with a combination of speed and power when he gets his opportunities.